BlackBerry Storm 2 confirmed | BlackBerry Blast! Just yesterday we wrote about a rumor that the BlackBerry Storm 2 with WiFi and a better touchscreen was headed for Verizon. Now comes word that a RIM employee has confirmed the device. 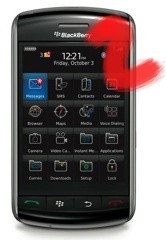 According to the Dutch site Tweakers a RIM channel sales manager named Alain Segond von Banchet says that the BlackBerry Storm 2 is scheduled to launch at the end of the year or at the beginning of next year. He also confirmed that the Storm 2 will contain an improved touch input method.